CPK is widely known for its innovative California-style menu, with a range of creative dishes that include hearth-baked pizzas, creative salads, pastas, soups, sandwiches and more. Black beans, sweet corn, jicama, fresh cilantro & basil, crispy corn tortilla strips, and Monterey Jack. Topped with BBQ chicken, tomatoes and scallions. Served with housemade herb ranch on the side. Also available with fresh avocado, shrimp or salmon. Fresh Shiitake mushrooms, water chestnuts and scallions tossed in spicy ginger soy. Available with chicken, shrimp, chicken and shrimp, or vegetarian. 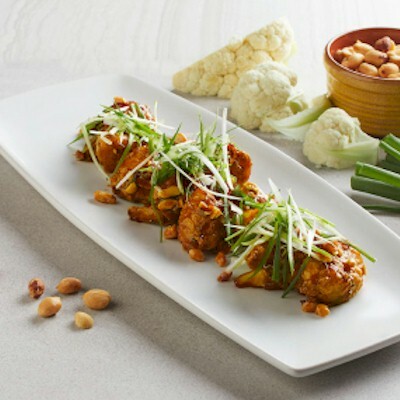 A combination of irresistibly sweet and spicy crispy cauliflower florets with toasted peanuts and scallions. Arugula, sun-dried tomatoes, toasted almonds and shaved Parmesan served with housemade lemon vinaigrette. Choose two of our signature soups side by side. Seared shrimp with black heirloom Forbidden Rice, baby broccoli, cauliflower, zucchini, carrots and watermelon radish, served warm in our housemade Shanghai sauce. Also available with chicken or salmon. Quinoa, baby kale, fresh cilantro & mint topped with warm grilled chicken, watermelon radish, fresh avocado, cucumber, carrot, bean sprouts, scallions and sesame seeds. Served with housemade chili-lime vinaigrette and serrano peppers. Cilantro farro and spinach topped with lime chicken, tomatoes, sweet corn, black beans, red cabbage, fresh avocado, poblano peppers and toasted pepitas. Served with housemade poblano ranch on the side. Crisp Romaine with shaved Parmesan and housemade garlic butter croutons. Also available with grilled chicken breast, grilled shrimp or sautéed salmon. Crisp veggies and fresh cilantro with chicken and the crunch of peanuts, wontons and rice sticks. Served with Thai peanut dressing. Also available with fresh avocado. Nueske's applewood smoked bacon, avocado, chicken, tomatoes, chopped egg, fresh basil and Gorgonzola. 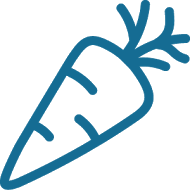 Recommended with housemade herb ranch or bleu cheese dressing. Try it with fresh beets. All pizzas available with choice of crust: Original Hand-Tossed Crust, Crispy Thin Crust, Wheat Whole Grain Crust, Thin Wheat Crust, Cauliflower Crust, Gluten-Free Crust. Our housemade lemon-garlic sauce with caramelized onions, shaved red bell peppers, wild Greek oregano, Mozzarella and Parmesan. Baby broccoli, eggplant, Cremini mushrooms, sun-dried tomatoes, roasted corn, red onions and Mozzarella. We love it on wheat whole grain crust. Also available with goat cheese. All pizzas available with choice of crust: Crispy Thin Crust, Original Hand-Tossed Crust, Wheat Whole Grain Crust, Thin Wheat Crust, Cauliflower Crust, Gluten-Free Crust. Caramelized Parmesan pizza crust served with field greens, tomatoes, shaved parmesan and our housemade Dijon balsamic vinaigrette. Also available with grilled chicken breast, grilled shrimp or sautéed salmon. 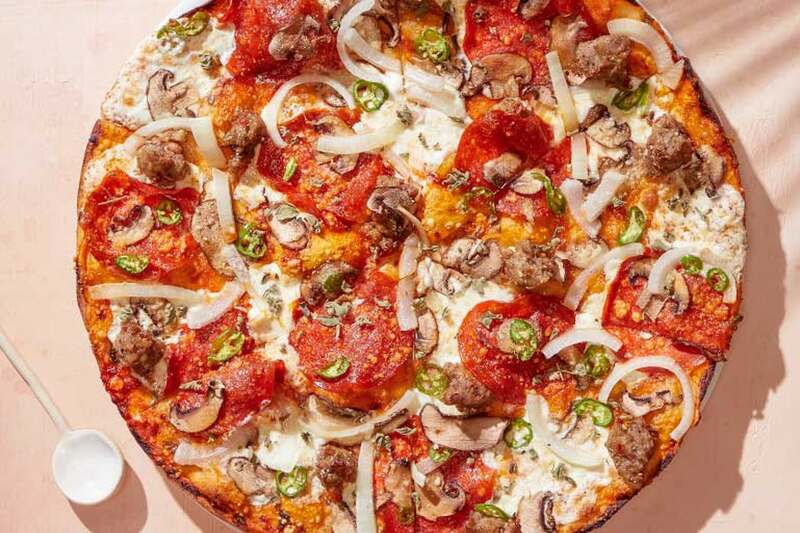 Crispy thin crust topped with spicy fennel sausage and pepperoni, serrano peppers, Cremini mushrooms, onions, spicy marinara, wild Greek oregano, as well as fresh Mozzarella and Romano cheeses. A combination of rustic and spicy pepperoni, Mozzarella cheese and wild oregano. Cremini mushrooms, rustic pepperoni, fennel sausage, torn basil, Mozzarella, tomato sauce and wild oregano. We like to call it "MuPeSa" (mup-suh). The classic. Italian tomatoes with fresh Mozzarella, basil and Parmesan. Substitute multigrain penne for any pasta upon request. All Sandwiches served with choice of soup or side salad. Oven-roasted turkey or grilled chicken breast with fresh avocado and Nueske's applewood smoked bacon on our toasted Ciabatta.